NORTH SHORE ROTARY club president Kim Gonzalez, left, and Rotary club members organize some of the Christmas Food Baskets that the club distributed to families last Thursday. NORTH CHANNEL – Following their annual tradition, the members of the North Shore Rotary Club packed and distributed almost 300 food baskets to families for their holiday meal. The club took special care to include healthy foods, such as fruits and vegetables, according to club president Kim Gonzalez. 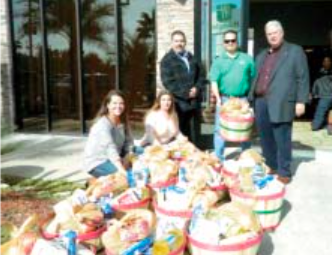 The number of baskets increased from about 200 last year, to this year’s total of 300. Club project chair John Parrott kept track of a distribution list, and all the club members loaded their cars and made the deliveries. The list of families was obtained from school counselors in the area. Jacinto City, TX. – Wednesday December 14, 2016 at the Jacinto City Town Hall Center Jacinto City Police Officers and Police Dispatchers were recognized for their exceptional service and performance to the community they serve. Police Chief Joe Ayala received an award from the Police Department’s personnel for his continuing dedication and service to the department and community. Ayala received another Commendation Award from Congresswoman Sheila Jackson Lee for his many years of law enforcement service. Sergeant Aguilera received Supervisor Of The Year Award, Sergeant Detective Silva received an Outstanding Service Award for handling sexual assault and crimes against children cases and Dispatcher Solis received the Dispatcher Of The Year Award.